Okay, enough Superyacht stories. We made it back safely to Troskala but unfortunately she was not in the state we had left her. She had now grown a lovely green beard and a nice black oil stain on the waterline from the dirty marina we had left her in. It was also noticed that three impacts had been made to port side and bow side, but only faint scratches, but nothing too serious but still annoying nonetheless. We were quick to leave and take her up to Jolly Harbour ready for checking out. On the way we found her sluggish and less than responsive due to growth. At 2,500 revs I was only making 4.0 knots over ground whereas I would normally achieve 5.5 knots. As we were walking around Jolly Marina Carlotta suggested that we could have her hauled out now instead of in America; I could not agree more. We visited the yard on the night we arrived and were booked for 10:00 the following morning. 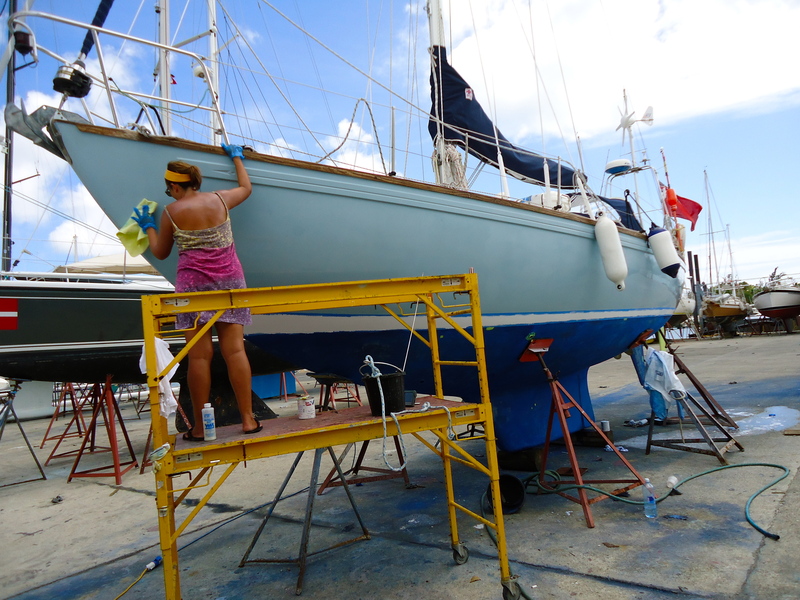 Jolly Harbour was a great choice as the yard staff were all kind and extremely knowledgeable. We were ready the next morning by the crane and at 10:30 she was being lifted out after 6,700 sea miles and 9 months on the water. It was true; she was very fouled with all sorts of marine growth clinging to her belly. We had also noticed a strange vibration on the propeller shaft, which we had put down to the rope cutter. This was the case as two of the supporting washers that keep the blade in-line had completely deteriorated; it was time to completely remove the rope cutter and instead fix another anode on the shaft as we had already lost the end shaft anode and I could already sea electrolysis occurring on the end of the propeller; thank God we took her out now instead of later. 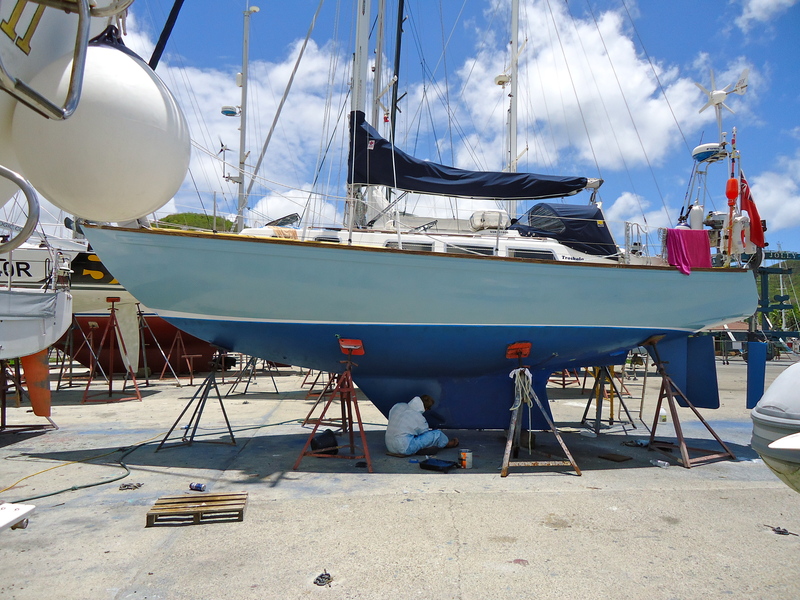 After a spray down she was settled into her stands and the work progressed, first to clean up the prop and the second to sand her down. 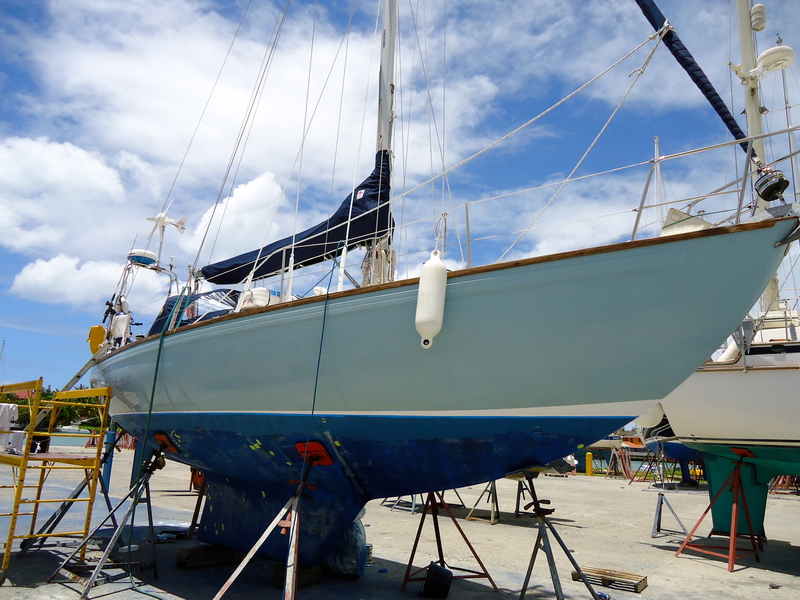 I hate antifouling but the worst part of it has to be the sanding. 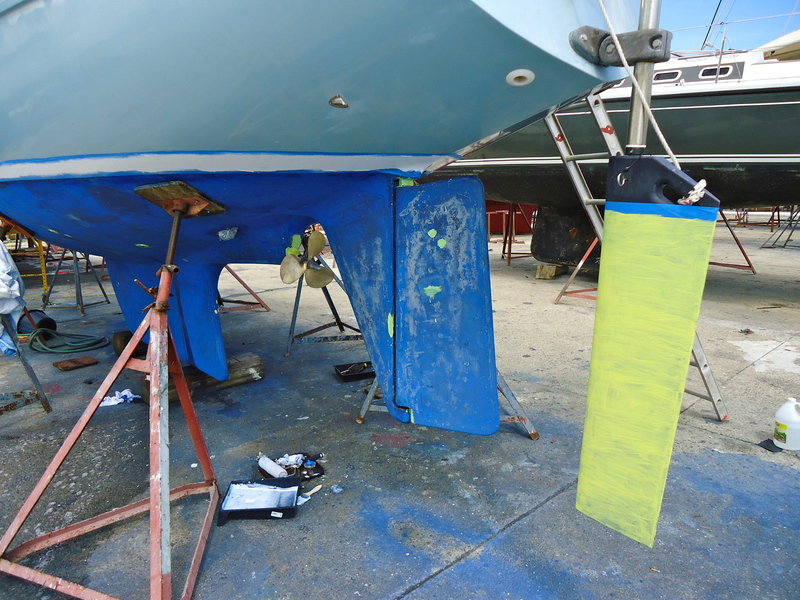 As we had used a European Antifoul that could not be brought over here I had to strip her paint right back to primer. Here is the most useful piece of information I can give here. 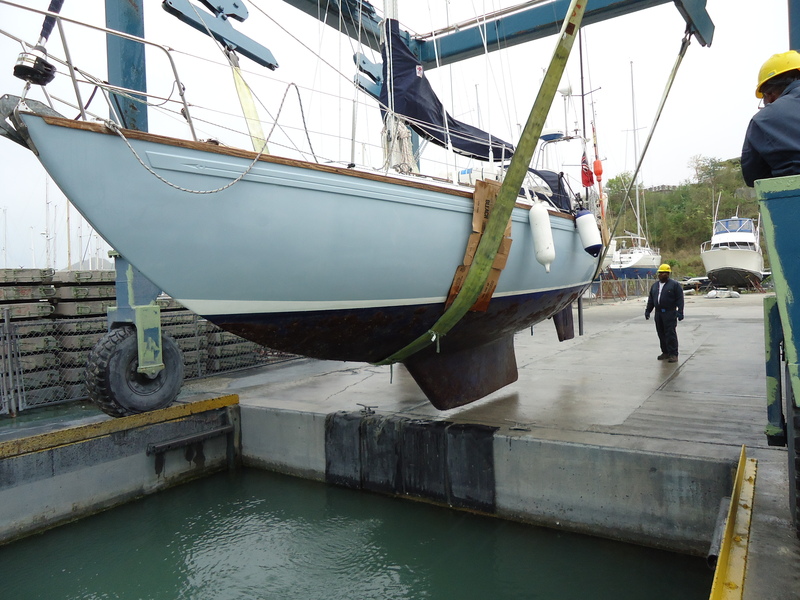 If you want to Antifoul your boat buy the antifoul in St Martins or America. 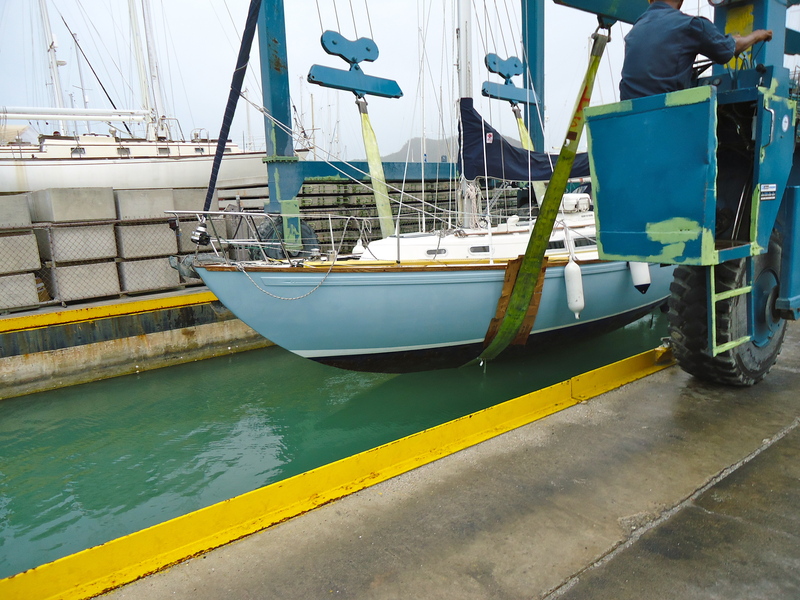 We paid for a gallon of Seahawk (heavy stuff) 10,71 EC, which works out to be £300 per tin, we needed two so already the antifoul was double the cost of the haul out, which was very cheap. 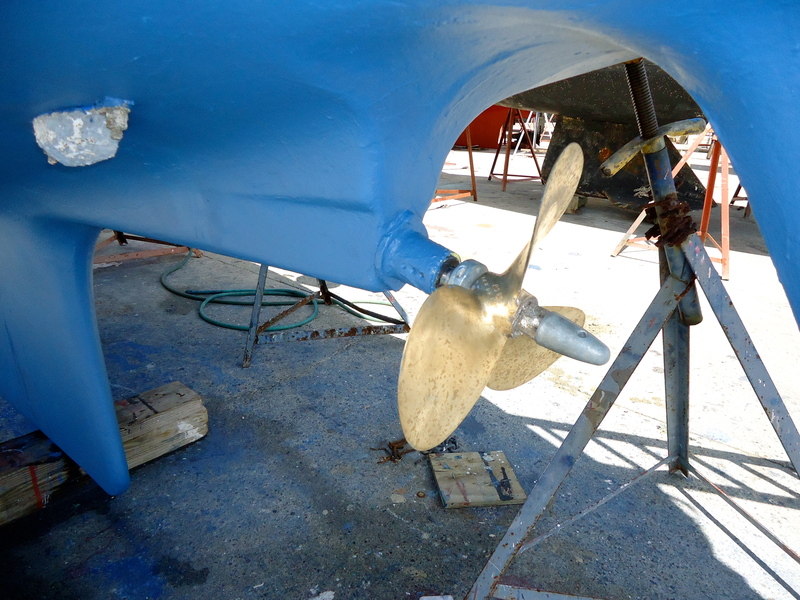 We did the necessary work and I even painted the Hydrovane rudder, which manages to get fouled every two weeks. 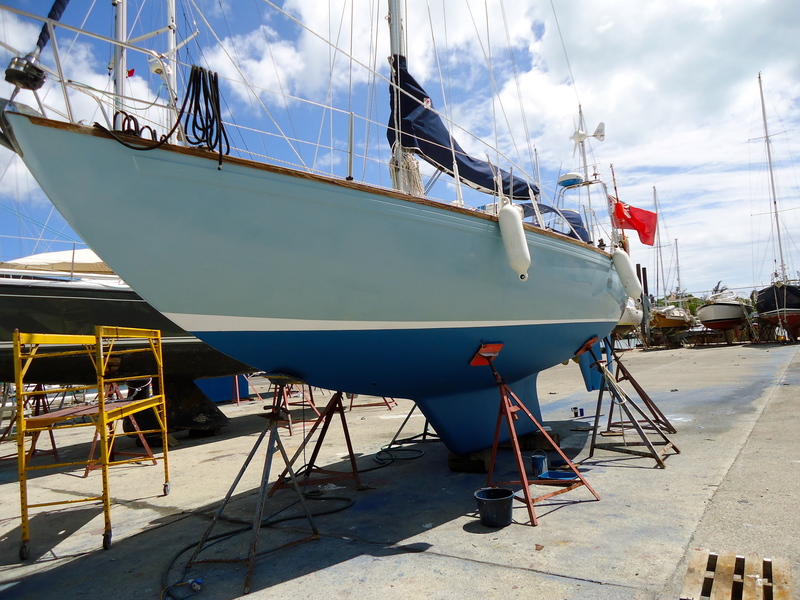 The total cost came to £900, which includes the yard fees and paint, a little more than I expected, but she looks good and will hopefully sail much faster than before. 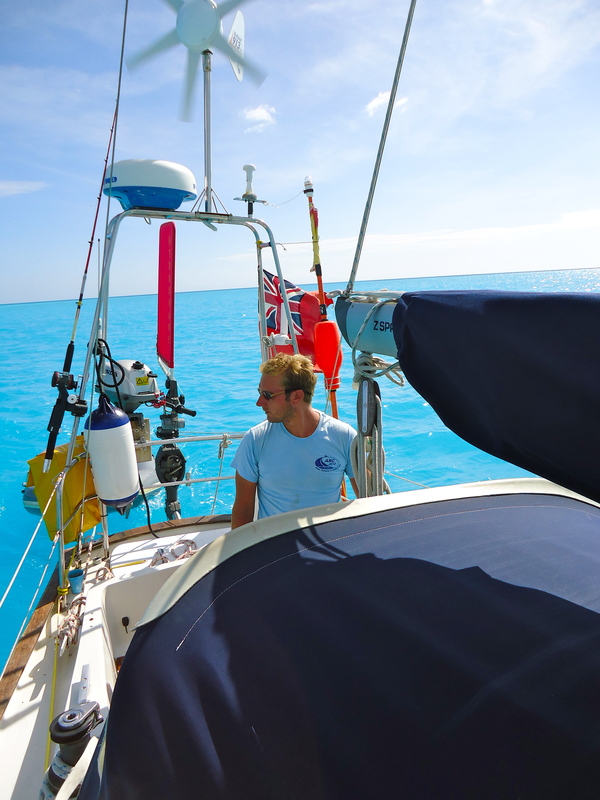 The good thing about taking your yacht out in Jolly is that you have a great Supermarket 5 minuets away and the best beach in Antigua 10 minutes away so when the heat of the day was too much we would just head to the beach to cool down before continuing work on Troskala. Again, I cannot sing the praises of the staff any more. Everyday a gentleman would come over to gave advise and help for free, it made the cost just about bearable. After 5 days on the hard Troskala was launched looking like new and with no vibrations coming from the shaft.